Pixar always likes to sneak in Easter eggs for their upcoming movies, and Brave is no exception. The studio placed their Easter eggs in the woodcarver/witch’s shop. There’s an image of Sully carved into a piece of wood since Pixar’s next film is Monsters University. Also, the studio has placed the Pizza Planet truck in every movie, and they had to get a little clever to get a car into a movie set in medieval Scotland. Their solution was to make it one of the witch’s woodcarvings and hide it behind a candle. Hit the jump to check out images of the Easter eggs. Monsters University opens in 3D on June 21, 2013. Images and info via Disney. NO MONSTERS IN THE CLOSET – A carving of Sulley, the lovable blue monster slated to return to the big screen in 2013’s Monsters University, appears on a piece of wood in the home of the Witch, an eccentric crone and woodcarver. 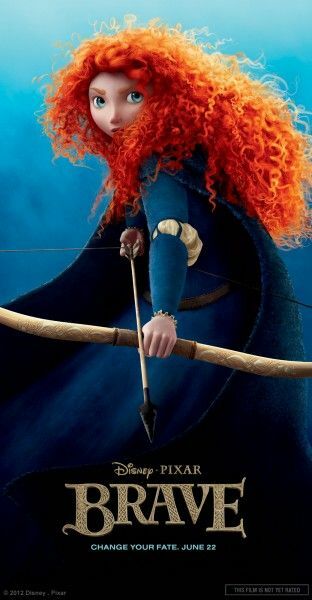 Set in the rugged and mysterious Highlands of Scotland, Disney•Pixar’s ―Brave follows the heroic journey of Merida (voice of Kelly Macdonald), a skilled archer and headstrong daughter of King Fergus (voice of Billy Connolly) and Queen Elinor (voice of Emma Thompson). Determined to change her fate, Merida defies an age-old custom sacred to the unruly and uproarious lords of the land: massive Lord MacGuffin (voice of Kevin McKidd), surly Lord Macintosh (voice of Craig Ferguson) and cantankerous Lord Dingwall (voice of Robbie Coltrane), unleashing chaos in the kingdom. When she turns to an eccentric Witch (voice of Julie Walters), she is granted an ill-fated wish and the ensuing peril forces Merida to harness all of her resources—including her mischievous triplet brothers—to undo a beastly curse and discover the meaning of true bravery.